Part of the show Can you 3D-print me a new kidney? Julia - The technology that we're using is called, Two-photon Lithography. It's a little bit like 3D printing but it's able to generate features that are much smaller in size. So, what we're doing is we're using this two-photon lithography process to write an open cell's structures in a polymer, and then we coat these polymer's scaffolds with a different material, and then we dissolve the initial polymer matrix. So, in a way, it's a sacrificial scaffold that we get rid of at the end and so the final structures are very, very light weight. But because the wall thickness in these structures is at the nanometre level, we are able to also control its strength. And so, we are able to make materials that are both really strong and really light-weight. Kat - I'm kind of imagining here almost a, you know, lattice structure. Maybe like the structure of the Eiffel tower. You make that in polymer and then you coat it with these tiny, tiny nanoparticles to build these very strong structures. Is that basically what you're doing? Julia - It's very close. You got it nearly right on. The only thing is that we don't coat it with nanoparticles, instead we coat it with a continuous conformal thin film. So imagine a two-dimensional nanoribbon, so to speak, and you wrap it around a three-dimensional architecture and then you remove whatever was on the inside so that you build a hollow Eiffel tower. So, it's effectively an Eiffel where each individual strut itself is a pipe. Kat - Now we know for something like the Eiffel tower, that's a very light structure 'cause it's full of holes but is also pretty strong. What sort of things could you use these materials for? How strong are they? Julia - Well. You tell me. So, imagine a brick made out of our nanotrusses. When it sits on your hand, it looks like a brick, it smells like a brick but if you drop it up in the air, it's going to fall slower than a feather. But at the same time it's going to be just as strong as steel or a ceramic. So, you can use these for building blocks where, for example, if you need propel something up in space. You would really appreciate having the low weight but at the same time the material has to be strong enough to be able to withstand the pressure from the vacuum. So, any kind of an application where you have to propel things up in the air or up into space, or a bridge for example. Or something where the weight is of essence but the strength is still required, they would be really good for. As well as they're also damage-tolerant. So, it's very hard to tear them apart, for example, or to break it. So, for any kind of a cushioning application where you need to protect a sensitive device. So as a foam or as a wrapping paper, that would work really well too. Kat - We've just heard from some people who are using this kind of printing technology to repair jet engines. But obviously, jet planes are really, really heavy and an enormous amount of fuel is burned just getting the jet across the Atlantic, regardless of the passengers and the payload. So, could this technology, for example, make air travel a lot cheaper or certainly use a lot less fuel? Julia - That is exactly right. 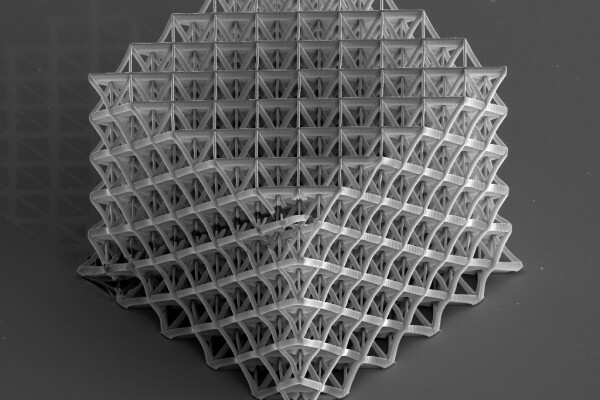 So, if we were to incorporate these nanotrusses in this skin on an airplane. Even if we were to replace 50% of what is currently being used with these materials, I think we can benefit tremendously from the cost savings in fuel. So, even a small reduction in the weight of the airplane would already facilitate a tremendous reduction in the price of the fuel that it takes to propel these very heavy machines through the air. So, our materials right now, we can't fabricate them in large quantities but if we could make sheets of paper out of them. And our vision is that we would be able to effectively roll-to-roll print these like paper towels. We can use this for the airplane's skin and wrap it around the airplane and thereby make the airplanes a lot lighter. One very neat thing about this technology is that these nanotruss materials can be made of just about any material that's available. So, it could be a ceramic, it could be a metal, it could be a semi-conductor. So, for these high-temperature applications, of course in the jet engines, it's very hot. We can use ceramics and they're generally very robust to high temperature and so we can make these nearly hollow ceramics that are robust to high temperature and robust to mechanical damage and incorporate them as part of the jet engines, and thereby we would significantly reduce the weight of the airplane without having to sacrifice any other properties like the ability to withstand high temperatures and damage tolerance. Kat - That does sound absolutely fantastic but how close to reality is this? How soon do you think you could see these types of materials, perhaps even becoming used in commercial applications? Julia - Oh, I think it's going to be within the next maybe year or two. We're actually very close to being able to produce these in quantities. The major road block right now is the writing of the polymer matrix. The step where you deposit a conformal coating, effectively the nano ribbon I was describing, of another material, a thin film of material, and then the subsequent removal of the initial polymer scaffold. Those technologies already exist today, so they wouldn't be show stoppers at all. It's the writing process and the two-photon lithography itself is a relatively slow process. So, we're working on developing a somewhat different technology that would enable us to quickly generate these patterns and they don't have to be just as complex, as long as we can do it quickly. So, we're looking at other technologies and pairing up with several companies to try to identify what would make the most sense but our vision is to try to roll-to-roll print them so we can generate sheets of these materials which can then possibly be laminated or somehow stacked together to make larger three-dimensional structures. Previous What is life and where did it come from? How does a white surface reflect light?